Wow! Looks awful. I hope they find you much less tasty as this season continues! Yikes, that was quite the reaction. 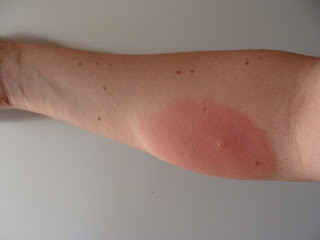 How long did it take for the reaction to occur after being bitten? Was it right away, or the next day? I live in B.C. and we get blackflies too. I react the same way every time. Try Bag Balm on the bites. It's the stuff farmers put on their cows utters. Im not joking. It takes rhe sting and itch away. My husband never gets bitten. It's crazy. Just my dog and me... a feast for the flies. Thanks for the tip - I'll look out for that! And in reply to the previous comment - the reaction occurred the next day.